Stars General Manager Joe Nieuwendyk announced today that the NHL club will sign center Mike Modano to an official NHL contract, giving him the opportunity to officially retire as a Dallas Star. Modano will sign the contract at Friday’s press conference. Afterwards, Modano will send in his retirement paperwork to the National Hockey League. The amount on the contract will be $999,999. Modano, 41 (born June 7, 1970 in Livonia, Mich.), is the all-time leading scorer among American-born players in NHL history in goals (561) and points (1,374). Playing 22 seasons in the National Hockey League, he was the first overall pick in the 1988 NHL Entry Draft by the Minnesota North Stars. 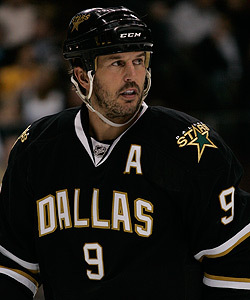 Modano came to Dallas with the Stars when the team relocated to North Texas in 1993 and was part of the 1999 Stanley Cup-winning club. He signed with the Detroit Red Wings last summer, playing his final season in the NHL in 2010-11.